The traffic jams have become order of the day in this temple town with police personnel rarely in sight putting the visiting pilgrims, tourists and common people to a dock. Rash and negligent driving by the youths violating the traffic norms is adding to the woes of people. Migratory birds have started flocking to Pong Dam, one of the biggest man-made wetland areas of North India that has also been declared a Ramsar site. Law-enforcement agencies in Chamba district are now on their toes to crack down on those who are involved in the clandestine activities of illegal mining in the district. CRB Lalit, a former IAS officer and presently chairman of Mukund Madhuram Trust, has been conferred with the “Glory of India” award by the India International Society at Dubai recently. Human interference disturbing the fragile ecology of a high Himalayan mountain pass overlooking this tourist resort has caught the attention of the Himachal Pradesh High Court. Over 1,200 youth from 25 colleges of the state visited an exhibition organised by the Red Ribbon Club on “HIV for youth” during a college fest held at Rait recently. Dr Narvir Chauhan, an Assistant Professor, Radiology Department, DRPGMC, Tanda, has presented a scientific research paper in the international radiology conference in South Korea which was appreciated on the global level as it was a rarest of the rare case. 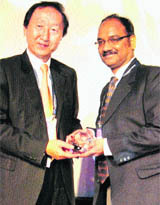 Dr Narvir Chauhan (R), Assistant Professor, Department of Radiology, DRPGMC, Tanda, receives the award from Dr Dong Ik Kim, president, Korean Congress of Radiology, for topping in the Radiology Photo Contest during the KCR-2011. Dr Mallika Nadda, general secretary of the social organisation Chetna and state president of the Special Olympics, was felicitated by senior citizens and various organisations here yesterday, when she arrived here after receiving the Rajiv Gandhi Manav Seva Rashtriya Award - 2010 from the Central Government. The district unit of Shiv Sena here has strongly supported the state government’s decision for asking all cement plant managements to ensure that cement prices here are not more than those of adjoining states. Dr DK Gupta, a Himachal Administrative Services (HAS) officer, has come out with his new book “Katha Chaubisi” - a collection of 24 stories written by writers of old and new generations of the state. I was at the Kalinath Kaleshwar Mahadev temple complex in Dehra, Kangra, last week. There are nine other temples for twenty different gods, including those of Radhakrishna and Gyara Rudra, here. 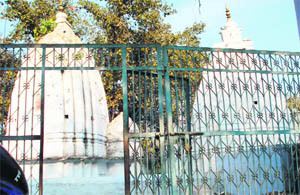 As one enters the complex, one sees the temples fashioned in the Shikhar style of architecture standing behind an iron fencing and gate with a sprawling banyan tree in the courtyard adding to the mysticism of the place (See Photo). A board claiming brief history reads: “The demons, once, propitiated Lord Shankar and asked for a boon to be the most powerful and Shankar granted it. The gods got afraid and requested Lord Vishnu to come to their rescue. The historic gaiety theatre reverberated with melodious ghazals rendered by accomplished and upcoming singers at a musical evening organised by the Munir Cultural Forum in the memory of ghazal maestro Jagjit Singh (see photo). The programme was part of the efforts being made by the forum to revive the Urdu poetry and ghazals among the youth. A yoga shivir was held at Kol Valley Nursing Institute for girls to commemorate second death anniversary of veteran social activist Dila Ram Thakur of Bohat Kasohal in Nehar Harnoda area. Pradeep Kumar from Jogindernagar college and Reeta Kumari from Hamipur college were adjudged the best athletes of the inter-college athletic meet which concluded at Paddal Stadium here recently. Nearly 2,500 vehicles enter this town daily from various palces. DRPG Medical College at Tanda, National Institute of Fashion Technology at Chaib, Polytechnic College and MCM DAV College in the heart of the town, besides other education institutes on the outskirts of the town and numerous schools located within the town were adding to the pressure on already crumbled traffic system in the town. The congested Tehsil Chowk on the Tanda road witnesses frequent traffic jams as this road caters to the needs of the patients and their attendants who visit Tanda Medical College, besides vehicles carrying pilgrims take this road to reach Gupt Ganga. The traffic jams are witnessed near the entry and exit point of the new general bus stand as the bus drivers stop their buses on NH-88 violating the traffic norms resulting in traffic jams. Ironically, a traffic police post had been set up at the bus stand, but no police official has ever been seen there to regularise the traffic. Triple ride without helmets is a common scene and now women drivers too enjoy triple ride without any threat from the law enforcing agencies. Rash and negligent driving by youths has become order of the day here. Traffic jams are witnessed outside the Civil Hospital here leaving large number of vehicles stranded and at times, the hospital ambulances were also caught up in the chaos. The buses coming to the town stop outside the hospital gate resulting in traffic jams with no one to check the trauma. Here also there a police personal is hardly ever seen to regulate the traffic, despite the fact it was a stone’s throw from the local police station. 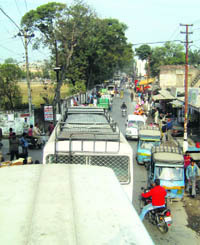 The College road, leading to the temple, witnesses traffic jams because of the parking of light vehicles on both sides of the road outside the municipal grounds without any check. The traffic jam on the Zamanabad road also puts the residents to inconvenience. On this road the taxi drivers keep vehicles on both sides of the road resulting in the jam with the police a mute spectator to the agony of the commuters and drivers. According to information gathered from the wildlife authorities, till date about 40,000 migratory birds have flocked to Pong Dam. The numbers are likely to go beyond one lakh by the end of December as the temperature dips in winters, according to officials. The bird varieties that already arrived at the lake include bar headed geese, one of the highest flying birds in the world. It can fly at a height of about 11,000 m. The Pong Dam is a favourite spot for the bar-headed geese in the country. There is a reported population of 70,000 bar headed geese across the world. Last year, over 50 per cent (about 40,000) of these birds were reported in the dam. The Wildlife Department with the help of the Bombay Natural History Society (BNHS) tagged transmitters in three bar headed geese at the dam. Since then, the department of wildlife officials have been monitoring the location of the tagged birds with the help of the GPRS. DS Dadwal, ranger at the Pong Dam Wildlife Sanctuary, said the three tagged birds flew in different directions. While one of the birds was in the area bordering China, the second bird was in the Leh area and the third in a high-altitude lake near Nepal. 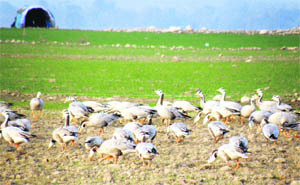 Wildlife and BNHS officials had wanted to ascertain the migratory route of these birds by tagging them with transmitters. A study in the past one year has revealed that these birds migrate into India from cold desert areas near the Chinese border. Besides, the bar headed geese, officials had also tagged one rudy shelduck bird and two ducks. While the ducks have remained in the lake as they did not migrate during summers, the lone tagged rudy shelduck bird has also been located near the Chinese border. Wildlife officials had also ringed 159 birds of various varieties last year. Two of the rings birds have revisited the Pong Dam lake this year. Other major varieties of migratory birds that have arrived in the dam include tusted ducks, common teals and white fronted geese. The officials said 120 white fronted geese have been recorded in the dam this year which is a significant number keeping in view that a few birds of the variety have survived in the wild. Dadwal further said this year also they would tag and ring various bird varieties coming to the lake in coordination with the BNHS. The data collected from tagging would be used for research purposes. Though the dam is a paradise for migratory birds, the state government has failed to exploit it from the tourists point of view. Recently, a grant of about 10 crore was sanctioned from the Asian Development Bank extended to the state for development of the lake as a tourist spot. In a major breakthrough, all the departments concerned, in a joint team comprising Sub-Divisional Magistrate (SDM) Rohit Rathour, Deputy Superintendent of Police Kulbhushan Verma and Mining Officer Sarit Chandra conducted a foray at three different locations at the Rajpura, Kiani and Udaipur areas of the district late on Sunday evening. Revealing this here yesterday, Chamba SDM Rohit Rathour said the administration had received information that some people of the area were carrying out illegal mining through the JCB (Joseph Cyril Bamford) machine on the riverbed of the Ravi. Since the use of JCB machine was strictly prohibited on riverbeds in Himachal Pradesh, the officials’ team, headed by Chamba SDM Rohit Rathour, swung into action and nabbed the offenders. During the raid, one JCB machine, which is used as a loader and excavator, and six tractors, were impounded by the officials, the SDM divulged, adding that a penalty of Rs 31,000 had been realised as compounding fee on the spot. The SDM said the excavation of sand, stone and gravel from the rivers and the nallahs (rills) would not be brooked at all as illegal mining was eroding the green hills alongside the rivers and nallahs. Further investigations in the occurrence were underway, the SDM added. Lalit has been, during his bureaucratic career and after retirement, working for advancement of culture and literature of Himachal Pradesh. The award was presented by the Tourism Minister of the United Arab Emirates (UAE). The name of Lalit was recommended by an expert panel of the Society. He remained a member of the Indian Historical Records Commission (a constitutional body) for nine years and also served as a member of the Executive Council & Programmes Committee of North Zone Cultural Centre and the Governing Body of Himachal Arts Culture and Languages Academy. He held the post of the director of the Language & Culture Department for seven years and during this period, he also organised an exhibition of Pahari paintings at Zurich Museum, Switzerland, which was the only such event held abroad so far. Lalit has published more than 12 books, including four poetic anthologies, and presented more than 100 research papers and articles on the culture of Himachal Pradesh. He has represented India as leader of Indian Cultural Contingents in Libya, Syria, Switzerland, USA, Canada, Germany and elsewhere. He has bagged several honours in the past which included Dr Parmar Samman for his outstanding services, Lifetime Punjab Kala Sahitya Academy Award, National Award of Peoples Order, Excellence Award, Indira Gandhi Sadbhavana, International Gold Star Award, India International Society Award and Akashvani Award. It has directed the officers concerned to bring all the records related to the ongoing construction activity near the Rohtang Pass (13,050 ft), located 52 km from here, on the next date of hearing on December 2. A Bench of Justices Sanjay Karol and Rajeev Sharma has restrained the state from new construction, except defence related, near the pass without the permission of the court till the state prepares an interim development plan for the area. The order was passed when state’s town planner AN Gautam informed the court that no interim development plan had been prepared by the Town and Country Planning Department to regulate constructions at the Marhi and Rohtang Pass. “The glacier of the area feeds our river basins and any damage will be irreparable. It will adversely affect nature and national economy. Hence, some immediate measures are required to be taken,” the Bench said. It observed that unregulated construction activity could adversely affect nature and “might result in landslides and soil erosion”. Rohtang is located in the Pir Panjal range. It remains snowbound for over six months in winter, cutting off the tribal Lahaul and Spiti district and also the strategically vital Ladakh region of Jammu and Kashmir. Officials say over 2,000 vehicles go over the pass every day during peak tourist season - from June till November. A major component of the traffic is defence vehicles with the forces reaching supplies to strategic points through the pass. JC Kuniyal, senior scientist of the Kullu-based GB Pant Institute of Himalayan Environment and Development, said Rohtang Pass’s eco-system was being damaged by the increasing tourist inflow and exhaust fumes of vehicles. “Excessive emission of carbon monoxide from vehicles and huge quantities of trash left by tourists on the pass are taking a toll on the snow cover,” said Kuniyal, who has carried various studies on the impact of pollution on the pass. “Over the years, we have observed that the snow cover in the Rohtang Pass is melting at a faster rate than expected. Earlier, snow remained on the pass till June-end. Now, it almost melts by May-end. This means there is an overall increase in temperature,” he added. He said at several points the snow was turning black due to soot accumulation. Even the rocks along the highway had turned black or dark grey. The stall decorated with heart-shaped red balloons, depicted a theme of AIDS campaign, “Getting to zero new HIV infections among youth”. Disclosing this here yesterday, Dr RK Sood, Kangra District AIDS Programme Officer, said for the first time a blood donors’ directory was made by the club with staff of ICTC Kangra performing blood group testing. He said over 50 youth benefited from the checkup and pledged to come forward for the noble cause of blood donation. Dr Sood said counsellor Meena and youth members of the clubs distributed pamphlets and pinned red ribbons on those present. He said prizes were distributed among the youth who had participated in a quiz competition focusing on knowledge of health, HIV, STI and blood donation. Sumit, who won the second prize in an inter-college painting competition, depicted AIDS as giant snake threatening to engulf the earth, and gave the message that despite the progress, there was no time for complacency. Students of the Gian Jyoti College of Education, Rajol, presented a mime on HIV risk among youth, and suggested an interaction on HIV and AIDS. Charu Kaushal, nodal officer of the club, stressed on mutual respect with responsible and healthy relationships among the youth, besides creating an environment without discrimination against patients affected by HIV and AIDS. She said the best approach was to enlist young people who could communicate with their peers and Red Ribbon Clubs were playing a lead role in this direction. Disclosing this here yesterday, Dr Anil Chauhan, Principal, DRPGMC, said Dr Narvir was invited for a three-day Korean Congress of Radiologists-2011, a conference of radiologists from all over the world, held at Coex in Seoul organised by the Korean Society of Radiology, recently. He said Narvir was the first doctor to represent the Tanda college in an international conference which was attended by nearly 150 international delegates, besides about 1,500 Korean delegates. Narvir said his radiological findings discovered in a patient suffering from a rare disease were the first of its kind in the world. He was awarded a gold medal by Dr Dong Ik Kim, president, Korean Congress of Radiology, for topping in the Radiology Photo Contest during KCR-2011. This award is given every year to three women social activists for doing distinguished work in the field of child welfare and other similar areas. She was presented bouquets, mementoes, caps and shawls by representatives of various organisations. Showing gratitude for her felicitation, Dr Nadda declared that she was donating the prize of Rs 1 lakh given to her in Delhi to Chetna. She said there was nothing more satisfying than to ensure a smile on the face of a special child and one should feel fortunate if one could get such an opportunity at least once in a day or at least in a week. She pleaded for 3 per cent reservation in services for special children by a corporate house in the state and said the corporate house at Baddi had accepted her suggestion to come here in the near future to hold an employment recruitment mela for special children. She declared that the Durga Puja Samiti, an associate organisation, would be organising marriages of girls of poor families. Nand Prakash Vohra, president, Chetna, said a plot was being purchased for Chetna at Chandpur, near here. A special school bus had already been provided for these children here by Chetna, he said. Nagar parishad president Rajni Sharma, Himalaya Parivar district president Ram Lal Pundir, Special Olympics district president Brig JK Varma (retd), Bilaspur Sadar Block Development Committee Chairman Amar Singh Thakur, nagar parishad members and senior citizens, including Krishan Lal Sharma, OP Garga, JK Nadda, Hukam Singh Thakur, Sohalal Sharma, Col AP Gauttam (retd), RL Sharma, Munir Akhtar, were among those who were present. Addressing the mediapersons here, Shiv Sena district president Satish Soni, Ghumarwin unit president Ashwini Kumar Thakur and spokesman Suresh Pandit said this was for the first time that the government took a stand on this subject, although people of the state have been crying against the high prices for past several years. Not only these managements are exploiting state’s natural wealth and selling cement at throwaway prices but also destroying state’s tourism industry which is affected by the polluting cement plants. These cement plant lead to destruction of hill features, flora and fauna and high-density increase in dust, smoke, choking of roads, apart from deteriorating condition of the main roads due to plying of thousands of trucks. The Shiv Sena has stressed that these factories are enjoying several benefits from the government for setting up their plants and earning crores every year. These factories have gone virtually wayward and require to be tamed by some essential strong steps. These should not be allowed to blackmail people or the government only because these factories pay some taxes to the state, they said. They said the government should take suitable exemplary steps against these factories to discipline them. Gupta, through this anthology, aims at delineating emerging trends in story writing in Himachal Pradesh. “It was during the course of editing “Setu” that I got acquainted with story writing in Hindi and writers in the state which inspired me to publish this collection of stories,” he adds. 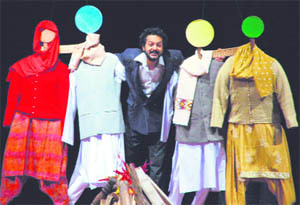 “Setu had published a special supplement on Hindi stories in 2010. It elicited good response from the critics throughout the country, he says. It was on the suggestion of Dr Sushil Kumar Phull, a renowned Hindi author and critic, and Dr Niranjan Dev, JNU alumni from Kullu, the edition of “Setu” was upgraded and updated and after a year’s work, “Katha Chaubisi” was published. The book has been published by Yash Publications, New Delhi, and would be released soon. Stories written by Dr Sushil Kumar Phull, Yogeshwar Sharma, Dr Kailash Ahluwalia, Narender Nirmohi, Tajinder Sharma, Ratan Chand Ratnesh, Madan Gupta, Bhagwan Dev Chaitanya, Suresh Shandilya, Murari Sharma, Rajeev Trigarti and Vijay Rani Bansal have been included in this anthology. I found that the main temple had a modest tower and the recently plastered, white-washed entrance to the Garbh Griha (sanctum sanctorum) negated the antiquity assigned to the temple. The Garbh Griha, of course, is amazing where the shivlingam is a couple of feet below the surface ever-washed with fresh water oozing out of the earth. Swami Arunanand Saraswati from Coimbatore has been supervising this complex since 1964. Another legend that goes with Kaleshwar is that the Pandavas came to this scenic spot on the banks of the Beas. They were overwhelmed by the beauty of the place and decided to make a city here and spend some time of their exile. A condition of their exile was that they would not be seen during the daytime. The city, therefore, had to be constructed within a night. They poured the water that they had brought from five pilgrim destinations -Haridwar, Prayag, Ujjain, Nasik and Rameswaram - in a pond. It is called “panjtirthi” now and people come here in large number during the Baisakhi Mela. The Pandavas started constructing the steps of the stairs from the bank of the Beas upwards when an old woman living nearby got up and after finishing with the morning chores started grinding wheat. The Pandavas thought that the night was over and afraid of their detection left the place leaving the city incomplete. The flight of steps still exists. Balram Sharma, living in nearby Nehran Pukhar village, told me that he had seen the Beas covering the steps and flowing close to the temple in yonder days. Here I would digress and appreciate the villagers of Nehran Pukhar, who have constructed a beautiful temple of Durga on the lake (pukhar) itself through their own contributions and public donations. The initiative taken and efforts put in by Late Shashi Dogra, who had served in the IPS, in building it are still remembered by the people of Nehran Pukhar. The temple inaugurated in 2010 is a beautiful sight at night when its lights and their reflection in the water give star-studded vista. Priest at Kaleshwar: Best is to take a dip in the Beas before retiring. Man in 50s: I cannot stay here for another 10 years. The historic gaiety theatre reverberated with melodious ghazals rendered by accomplished and upcoming singers at a musical evening organised by the Munir Cultural Forum in the memory of ghazal maestro Jagjit Singh (see photo). The programme was part of the efforts being made by the forum to revive the Urdu poetry and ghazals among the youth. Jagjit Singh had played an important role in revival of ghazal singing and organising a programme in his memory is the best way to promote this genre of light classical music, says Pravesh Jassal, president of the forum. The programme featured Gopal Bhardwaj, a trained musician currently working as a lecturer in government college, Theog; Anil Shastri, an accomplished singer; and upcoming singing duo Uma-Kamlesh. 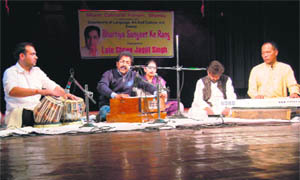 The husband-wife team of Vinay Abrol and Deepa also regaled the audience with the ghazals of Jagjit Singh and Chitra Singh. Apart from soulful rendition of ghazals, the programme stood out for the deft tabla playing of Neeraj Shandil and scintillating performance of Heera on the keyboard. The evening devoted to ghazals provided the much needed diversion to the music lovers. The residents of the state capital continue to face hardships due to shifting of the main bus stand to Tuti Kandi and they have not given up their agitation to press their demand for operating all bus services from 8.00 pm to 8.00 am from the old bus stand. The Bus Stand Bachao Sanghrash Samiti has urged the administration to implement its demand from December 1, failing which it would intensify the stir. The residents face problems in reaching Tuti Kandi at odd hours due to inadequate transport facilities. The samiti has also demanded that all bus services originating and terminating within a radius of 60 km from the state capital must touch the old bus stand for the convenience of daily commuters, particularly the vegetable- growers, who bring along their produce to market in buses. It announced its plan to organise a “Shimla Bandh” on December 14 if its demands were not accepted. Besides commuters, the shopkeepers of the old bus stand are also facing financial hardships due to loss of bsiness. In most of the race events, boys of Jogindernagar shone with Pradeep excelling in three track events.Similarly, girls from Hamipur college showed their mettle in the women’s category. In men’s 10,000-m race, Shiva from Bilaspur, Amit from Amb and Pinku Ram, Nerwa came first, second and third, respectively. In 500-m race, Pradeep from Jogindernagar; Manmeet from Una; and Anil from Amb came first, second and third, respectively. In 1,500-m race, Pradeep from Jogindernagar; Balvinder from Hamirpur; and Shiv Kumar from Bilaspur won the top three slots. In 4X100-m relay race, Una, Jogindernagar, and Poanta Sahib won the three top positions. In Javelin throw, Jeevan Palampur, Ashok from Poanta Sahib, Ramesh Palampur emerged as top three winners. 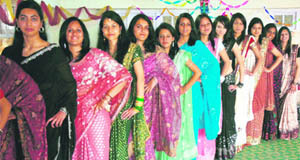 In women’s category (race), Rita Kumar from Hamirpur; and Puja and Kavita from Jogindernagar won the top three titles. In Javelin throw, Shubha Thakur from Nahan; Suman from Solan; and Priya from Sundernagar, secured first, second and third positions, respectively.In high-jump event, Usha from Sangrah, Babita, Bangana, and Rekha from Nahan came first, second and third, respectively. Hamirpur, Dharamsala and MLMS, Sundernagar, won the top three slots of the 4x100-m relay race.In 400-m race, Sonika, Rishu from Hamirpur and Meera from Dharamsala were the first three winners.Mandi DC Devesh Kumar distributed prizes among the winners.